Advantages: Good overall coverage, easy to read, varied selection of photographs. Traditionally, German subjects are always a favourite with the buying public.Whether due to the technology, use of the item in question or even the way the vehicles were painted, the fascination lives on. So this title in the Tanks in Detail series should find many an inquisitive reader. Like others in the series, this edition contains 96 pages within its soft card covers. A generous collection of photographs has been included and these amount to over one hundred. There is a combination of both black and white as well as a sprinkling in colour. These latter photos being of various museum based vehicles. The selection chosen is very good and the reproduction is to an equal standard. Most are reproduced two to a page and therefore show a fair amount of detail. Not only are there the prerequisite overall views, but many close-ups and interior shots. Armour arrangement diagrams have been selected for certain vehicles, these showing the thickness at various points. It would have been nice if these were available for all the main types discussed. There are nine illustrations of the vehicles on show. Unfortunately these were found to be of mixed quality with no more a few words for a general caption. The book is divided into five chapters. The first gives an introduction to the development of the Jagdpanzer and the reasons for its implementation. 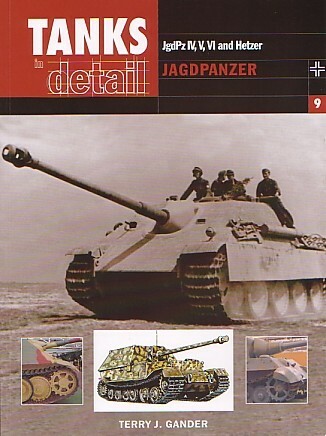 Subsequent chapters are devoted to the Jagdpanzer IV, Jagdpanzer 38, Jagdpanther, Ferdinand/Elephant and Jagdtiger. All are reviewed in an easy to read style. There is quite a lot of material to cover in a book this size, but the author has managed it well. The result is a compact guide to these vehicles that becomes an excellent introduction to the more specialised publications on the subject.